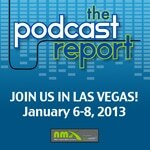 010 The Podcast Report – Leo Laporte Coming To NMX – Podcast Community Manager – And More! I’m very excited to welcome Megan Enloe as a co-host to The Podcast Report. Back in August, the staff of NMX hired Megan to come on board as a community manager for the podcasting community. In the episode, we explain how this differs from my role as the director of podcasting for the conference. One thing is for sure, I could not be happier to work with Megan to bring about the full vision that the staff of NMX has for the podcasting community. You’ll get to hear a great deal more about this vision as we produce weekly episodes of The Podcast Report between now and the show in January. In this episode, Megan and I talk briefly about the official announcement of the name change from BlogWorld & New Media Expo to NMX (New Media Expo). We also talk about the fact that the next event is coming up January 6-8, 2013 in Las Vegas. The room rates are only $99 per night and if you’re a geek like me, you may want to stay an extra day or two to check out CES. I’m super excited to announce that Leo Laporte will be providing our Keynote address for Monday, January 7th. Leo is going to be doing something out at NMX that you will simply not want to miss. However, we’ll talk more about that in next week’s episode of The Podcast Report.